Over at Forbes, Nick Sibilla from the Institute for Justice (IJ) reports that California Governor Jerry Brown has signed Senate Bill 443, a much-debated piece of legislation that strengthens the state’s protections for innocent property owners against civil asset forfeiture. Civil forfeiture is a hotly contested tool of law enforcement allowing government to seize and keep property suspected of being involved in criminal activity—without necessarily levying criminal charges against the individual, let alone seeking a conviction in court. “Through a federal forfeiture program called “equitable sharing,” state and local law enforcement agencies may collaborate with a federal agency, like the DEA or ICE, and forfeit seized property under federal law, even if that would circumvent California’s more stringent protections for property owners. Moreover, if a property is forfeited federally, participating agencies may receive up to 80 percent of the proceeds—higher than what California law grants to law enforcement. This new requirement that a criminal conviction must be obtained before property can be forfeited even via equitable-sharing arrangements is particularly consequential for California. According to the Institute for Justice’s “Policing for Profit” report, a national survey of civil forfeiture practices in all 50 states and the federal government, California ranks 50th in the country for receiving payments through the equitable-sharing program. Between 2000 and 2013, nearly $700 million in proceeds from the Department of Justice was disbursed to local and state law enforcement agencies in California, with an additional $108 million coming from the Treasury Department. This is roughly $200 million more than the next lowest-ranked state—New York—receives through partnering with the federal government in forfeiture cases. 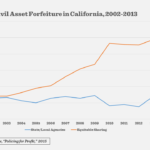 As roughly 87% of DOJ forfeiture cases conclude without a criminal conviction, as much as $610 million of the proceeds derived from that department came from Californians who were, at least in the eyes of the law, innocent of any crime. By curtailing the ability of law enforcement to “venue shop” for a favorable jurisdiction, SB 443 should be a major step in the right direction towards protecting such individuals. California joins a growing chorus of states that have completed civil forfeiture reform in various degrees over the last two years—from full abolition in Nebraska and New Mexico, to criminal conviction requirements sans equitable-sharing reform in Maryland, New Hampshire, Alaska, and Montana. Other states have passed stronger reporting requirements and higher standards of proof (Michigan), or now require that individuals be at least arrested for a crime before forfeiture cases can proceed (Florida). What’s interesting is that California started reform efforts while having relatively strong protections against civil forfeiture to begin with. Before SB 443, the state already had a conviction requirement when property was valued at $25,000 or less. Now, that threshold has been lifted to $40,000. Contrast this situation with a state like Texas, another large state with pervasive forfeiture activity. 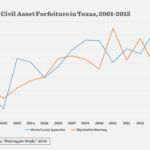 While Texas has been a national leader in enacting other criminal justice-related reforms, the state is performing abysmally in protecting citizens against forfeiture abuse. Between 2000 and 2013, the state has averaged over $40 million a year in forfeiture activity, with an additional $37 million per year coming from the equitable-sharing program—enough to rank the state 47th in IJ’s forfeiture report. There is no conviction requirement, a relatively low standard of proof—a “preponderance of the evidence”—and a burden of proof that rests on the individual to prove their innocence, not on government to prove guilt. For a state that prides itself in its freedoms—not to mention its fervent skepticism of, and independence from, ever-encroaching federal authority—these facts are bound to rankle. The shoe is on the other foot now, where Texas must take its cue from another state. As well it should. A large, populous state such as California has just upped the ante on forfeiture reform, showing others that while forfeiture is a legitimate tool of law enforcement for fighting crime, protecting innocent property owners from being ensnared in a net meant for bona-fide criminals is essential, as well. All that remains now is for Texas and others to apply that lesson themselves.